Hi im quite new to all this but i bought a Bashan ATV at the weekend and it needs a few things doing to it to get it to run. The thing is i have no idea what model it is, the guy i bought it off thought it was a BS200-7 but when i look up the number plate it comes up with Vixen250, but not the right cc. Im finding it really hard to find parts for it because i have no idea what model it is! Any help would be great! Thankyou! I had quite the ride the other weekend. I rolled the quad then kind of submerged it. Needless to say I'm having some issues with it now. It idles fine, but when you lower the choke and give it some gas it pops out of the carbuerator and backfires from the exhaust. The carb is clean and the fuel is clean. I also changed the oil and the diff. I changed the spark plugs and checked the CDI box by switching it with a working one. Any other suggestions? Any and all suggestions would be appreciated!! Electronic Power Steering? Did you guys see this? Features & Benefits New for 2007 Honda's revolutionary Electric Power Steering (EPS) system offers speedand torque-sensitive steering assistance for increased control and comfort under tough conditions. Front and rear suspension are revised specifically for the Foreman with EPS. Unique Features EPS is a unique system consisting of an ECU-programmed electric steering assistance motor and multiple sensors. 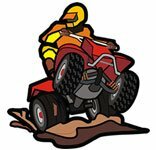 These sensors measure the handlebar torque applied by the operator as well as the ATV's speed to determine the correct amount of steering assistance required for all conditions. More assistance is provided in rough terrain and at low speeds to decrease the amount of steering effort required, while less assistance is provided at higher speeds and in smooth terrain. This innovative technology also decreases bumpsteer and kickback through the handlebar in all conditions. The sophisticated Showa system includes separate ECU programming for 2WD and 4WD modes, while spring-loaded steering-motor gears minimize play to increase steering feel and feedback at higher speeds. Traxlok® enables the rider to shift between 2WD and 4WD with the simple push of a switch and provides quiet, smooth engagement with shift-on-the-fly capability. Torque-sensitive front differential reduces torque steer for less steering effort and, when combined with EPS, provides unmatched 4WD steering effort and precision. Dual front disc-brake calipers feature a patented built-in scraper system to remove mud and snow from inside the front wheel. This helps to prevent buildup of debris between caliper and rim and ensures consistent braking performance. Brake pads feature thick, long-wear material with improved mud durability, feel and control. Pads have an internal scraper that gives audible warning when pad life is low. Standard-equipment oil cooler. Engine/Drivetrain Powerful four-stroke 475cc OHV air-cooled longitudinally mounted engine allows direct driveshaft alignment to both front and rear wheels for improved drivetrain efficiency. The overhead-valve arrangement features angled valves in a hemispherical combustion chamber for straighter intake and exhaust flow for improved engine performance. Rubber-cushion engine mounting and gear-driven counterbalancer reduce vibration. Snorkel-type air-intake system is specially designed to resist water intrusion. Integral electric carburetor heater system improves driveability and ensures smooth operation in cold conditions. Closed crankcase vent system safeguards against engine oil contamination. USDA-qualified spark arrester/muffler is constructed of stainless steel. Traxlok is easily engaged by pushing a switch on the right handlebar. An electromagnetic mechanical clutch unit located on the center of the propeller shaft engages 4WD with a quiet two-way roller clutch. Traxlok ensures smooth operation by employing a magnetic switching mechanism that engages when front and rear wheel speeds vary by less than 6 mph. A 4WD indicator light on the LCD meter shows "actual" 4WD/2WD engagement status. Electric Shift Program (ESP) provides push-button upshifting and downshifting. The rider shifts simply and precisely with the press of the upshift or downshift button mounted on the left handlebar. An onboard electronic control module (ECM) monitors information from four sensors--engine rpm, countershaft speed, shift drum angle and shift spindle angle--to control the speed of the electric shift motor's gear and clutch engagement. Gear-engagement speed varies according to rider style: The transmission shifts more quickly when riding style turns sporty. A neutral lockout at speeds greater than 2 mph ensures available engine braking when descending hills. For smooth shifting, the transmission cannot be shifted from Neutral to First gear or Reverse gear at engine speeds above 3000 rpm. ESP is not battery-dependent, operating whenever the engine is running. Should the rider ever need to shift manually, the ES model is also equipped with an auxiliary shift lever in the tool kit. Super-heavy-duty automatic clutch for excellent driveability and towing capacity. Convenient five-speed transmission with Reverse. Maintenance-free shaft drive with torque-sensing front differential routes power directly from the longitudinally mounted engine without inefficient directional changes. Convenient electric starter with auxiliary recoil starter features an automatic internal decompression system. Wet-sump engine carries a large 3.2-quart capacity. CD ignition with electronic advance for excellent performance and reliability. Reusable foam air filter. Chassis/Suspension Rugged frame and suspension provide an exceptional 7.5 inches of ground clearance. Independent double-wishbone front suspension uses KYB shock absorbers to give 6.7 inches of travel. Steel swingarm and dual KYB rear shock absorbers give 6.7 inches of travel. Rugged, large-diameter 25x8-12 front, 25x10-12 rear tires provide added ground clearance while maintaining precise handling. Dual 180mm front hydraulic disc brakes combine with sealed 180mm mechanical rear drum for excellent stopping capabilities. Ok so I have a recon 250 that will not idle. It will rev up and go as long as u don't let it idle it will run fine. Fist thought to everyone I know would be the idle jet. Cleaned the carb and put a kit in it while I was there. Changed the spark plug as well. These carbs have that fuel cut off vacuum valve on it. If I take the line that's coming from the intake and plug it off it will idle just fine with no problem. I know its not how its pos to be but I just cant figure anything out on it. Im at a lost. Any suggestions would be appreciated. O Ive already checked the valves and also adjusted the air. Its got to be something with the vacuum operated valve whatever it is or does... Thanks. 2007 Suzuki Vinson blowing ignition fuse HELP!!!!! Good morning, I am having an issue with my 4x4 actuator not engaging. Display shows 4x4 all the time and differential is locked. The 4x4 switch does nothing and I have checked the fuses and all connections. I had recently replaced my wiring harness and the 4x4 worked fine before this. I am afraid the actuator failed but not sure how to troubleshoot it. I have friend with a 2007 sportsman 500. When we rund the bike for a while and shuts it off it wont start for about 5-10 minutes. Then it starts fine. Anybody have this problem? Where should I start looking? I am going crazy trying to figure this one out. Recently snorkeled 700efi is overheating but I am inclined to think that the problem is not related to the snorkeling. My fan is no longer coming on. I checked the fuse and also the diode marked fan in the fuse box and found both to be OK. I checked the fan to make sure that it is working under normal conditions so I powered it directly from a battery and it works fine. I checked the continuity of the sensor and it works as well. Hooking a positive from an outside battery source to it. Once the temp got high enough the fan came on. I downloaded the wiring diagram from the forum and it indicates a diode in-line with the ground. Does anyone have experience with this? My friend has 2007 Honda TRX680FA Rincon. He wants to know if there is a power steering mod available for this? I don`t see anything in the service manual indicating it might have been a stock option. Hi guys ... I have 07 kq 450 and got the problem with starting when the fi light is on... When i boost the battery quad starts... That happen everytime when im ice fishing and quad just sits for 1hr or more... Anyone know what is the problem?